It was only when we were on the forest trail in Squamish that I noticed the signs about Sasquatch. Apparently I was hiking in the valley where he is rumoured to live, and so there were signs providing information and histories of sightings. I had a list of things I wanted to see when I got to British Columbia (BC), but unfortunately I never thought about adding Sasquatch to my list. The others, I was doing quite nicely on. 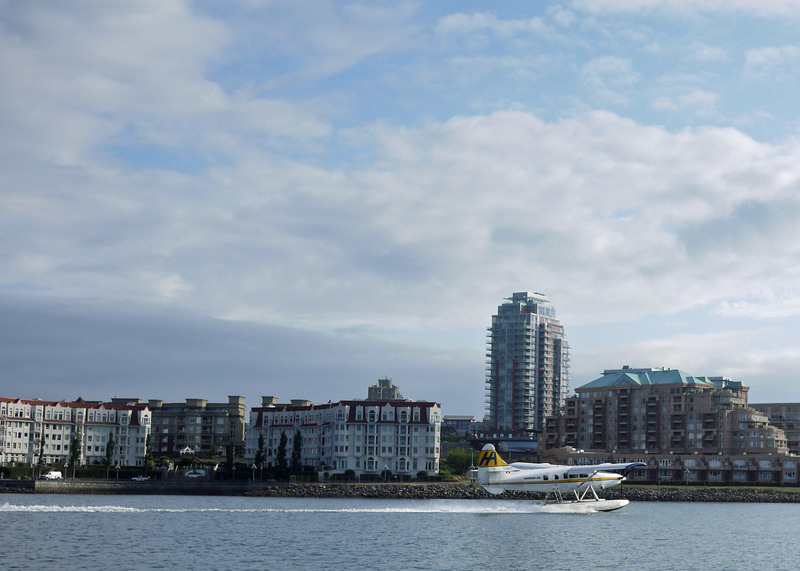 I wanted to ride in a seaplane, and I did that as a means of getting to Gabriola Island. Next up was bears, and I saw 2 (surprisingly to me – huge) grizzly bears up close and personal on Grouse Mountain. Seeing orcas in the wild was another of my aims, and so I booked an orca watching tour out of Victoria, the capital of BC, on Vancouver Island. My friends and I drove to Victoria from Gabriola Island. It is possible to take your car on most of the ferries that service the islands off the mainland, which makes getting around easy, if not exactly cheap. Victoria is a beautiful looking city with wide roads and many manicured public gardens and its harbour sees 40,000 seaplane landings a year. The 5.30pm tour I had booked was cancelled due to rough seas – I was waiting on the dock as the previous participants got off the boat and filed past in their (loaned) huge red waterproof gear. A few were nursing bruises and cuts from the boat slamming down in the waves – so I was happy to change my reservation and hope for better weather. We left at 9am the next morning and the weather was fantastic (luckily) – hot and bright with calm seas. We found a pod by the southern nautical tip of Canada which meant it was only us and 2 other fast boats present as we were the only ones with enough range to get there. I learned there are 2 types of orca: transitory (mammal eating) and resident (fish eating). We saw resident L orca pod of about 40 animals and the skipper managed to identify them for us by dorsal fin and saddle markings at a distance of about 150m which was quite an achievement. I couldn’t recognize one, even with the identification guide open right beside me. We also saw seals and sea lions, definitely keep upwind of them if you want to keep your breakfast. It was a fantastic 3 and 1/2 hours and the fast ride in the jet boat out to the pod was also a highlight.I definitely recommend using Eagle Wing Tours – the skipper was funny and friendly and very knowledgeable about the behaviour and biology of the orcas so you knew the company really cared about them, rather than seeing them as solely a money-making venture. So envy you Jodi. Sounds a fantastic trip.